bitterness, aroma, and maltiness. Ales can range from Pale Ale to a Stout. The main difference between lagers and ales (though there are more than a few) lies in the fermentation. For our first style post of RealHombrew.com, prescription I think it would be very appropriate to discuss the America’s biggest contribution to the beer world (at least in my opinion), the American Ale. It is safe to say that the majority of beer enthusiasts have enjoyed an ale at one time or another. In general, beers are classified into to main categories: ales and lagers. Both ales and lagers run the entire course of particular flavors. They both can vary in a wide range of colors, bitterness, aroma, and maltiness. Ales can range from Pale Ale to a Stout. The main difference between lagers and ales (though there are more than a few) lies in the fermentation. Ales are fermented with top fermenting yeast which, as you can imagine, hang around the top of the fermentor. Ales are generally fermented at warmer temperatures for shorter periods and are very simple to make. Lagers, on the other hand, are fermented at cooler temperatures for longer periods of time. The yeast used in fermenting lagers is different as well. Lagers use bottom fermenting yeast, which contrary to its ale relatives, hang out at the bottom of the fermentor. The result of this cooler, longer fermentation and bottom fermenting yeast is generally a crisper, clearer style of lager beer. For all-grain enthusiasts, ales are general made from 2-row malt where lagers are made from 6-row malt. In the modern world, pretty much all beers are fall into either the lager or ale category, or a hybrid of the two. I think it would be very appropriate to discuss the America’s biggest contribution to the beer world (at least in my opinion), health the American Ale. It is safe to say that the majority of beer enthusiasts have enjoyed an ale at one time or another. In general, beers are classified into to main categories: ales and lagers. Both ales and lagers run the entire course of particular flavors. They both can vary in a wide range of colors, bitterness, aroma, and maltiness. Ales can range from Pale Ale to a Stout. The main difference between lagers and ales (though there are more than a few) lies in the fermentation. Ales are fermented with top fermenting yeast which, as you can imagine, hang around the top of the fermentor. Ales are generally fermented at warmer temperatures for shorter periods and are very simple to make. Lagers, on the other hand, are fermented at cooler temperatures for longer periods of time. The yeast used in fermenting lagers is different as well. Lagers use bottom fermenting yeast, which contrary to its ale relatives, hang out at the bottom of the fermentor. The result of this cooler, longer fermentation and yeast is generally a crisper, clearer style of lager beer. For all-grain enthusiasts, ales are general made from 2-row malt where lagers are made from 6-row malt. In the modern world, pretty much all beers are fall into either the lager or ale category, or a hybrid of the two. Let’s get brewing! All the below basic styles are for a five gallon batch using liquid malt extract and hop pellets. Remember, American Ales have slightly more hop characteristics than their European counterparts therefore the hops are important in setting the American Ale apart. Look for U.S. domestically grown hops for your American Ales. Though I use domestic hops as a guide, their use is not by any means a hard rule. Feel free to substitute the hops with other hop varieties with similar Alpha Acid Units (AAU) to meet you personal taste or hops availabilty. You can use an ale yeast of your choice for fermentation. For the below styles, I recommend fermenting for at least two weeks before bottling or kegging, though fermenting for longer periods is often preferred. American Pale Ale. The American Pale Ale is pale in color, medium bodied, and has a distinct hop flavor and aroma. American Indian Pale Ale. I am a hops lover and the American adaptation of this British classic is one of my favorites. For this style, think back to the American Pale and make it hoppier and stronger. IPA’s in general are action packed with hops. They also tend to have a bit higher percent ABV than the other American Ale styles and have just a slightly heavier body. A bit of warning, this style has very high hop flavor and aroma! beers are classified into to main categories: ales and lagers. Both ales and lagers run the entire course of particular flavors. They both can vary in a wide range of colors, bitterness, aroma, and maltiness. Ales can range from Pale Ale to a Stout. The main difference between lagers and ales (though there are more than a few) lies in the fermentation. Ales are fermented with top fermenting yeast which, as you can imagine, hang around the top of the fermentor. Ales are generally fermented at warmer temperatures for shorter periods and are very simple to make. Lagers, on the other hand, are fermented at cooler temperatures for longer periods of time. The yeast used in fermenting lagers is different as well. Lagers use bottom fermenting yeast, which contrary to its ale relatives, hang out at the bottom of the fermentor. The result of this cooler, longer fermentation and bottom fermenting yeast is generally a crisper, clearer style of lager beer. For all-grain enthusiasts, ales are general made from 2-row malt where lagers are made from 6-row malt. In the modern world, pretty much all beers are fall into either the lager or ale category, or a hybrid of the two. the American Ale. It is safe to say that the majority of beer enthusiasts have enjoyed an ale at one time or another. In general, beers are classified into to main categories: ales and lagers. Both ales and lagers run the entire course of particular flavors. They both can vary in a wide range of colors, bitterness, aroma, and maltiness. Ales can range from Pale Ale to a Stout. The main difference between lagers and ales (though there are more than a few) lies in the fermentation. Ales are fermented with top fermenting yeast which, as you can imagine, hang around the top of the fermentor. Ales are generally fermented at warmer temperatures for shorter periods and are very simple to make. Lagers, on the other hand, are fermented at cooler temperatures for longer periods of time. The yeast used in fermenting lagers is different as well. Lagers use bottom fermenting yeast, which contrary to its ale relatives, hang out at the bottom of the fermentor. The result of this cooler, longer fermentation and bottom fermenting yeast is generally a crisper, clearer style of lager beer. For all-grain enthusiasts, ales are general made from 2-row malt where lagers are made from 6-row malt. In the modern world, pretty much all beers are fall into either the lager or ale category, or a hybrid of the two. For our first style post of RealHombrew.com, healing I think it would be very appropriate to discuss the America’s biggest contribution to the beer world (at least in my opinion), the American Ale. It is safe to say that the majority of beer enthusiasts have enjoyed an ale at one time or another. In general, beers are classified into to main categories: ales and lagers. Both ales and lagers run the entire course of particular flavors. They both can vary in a wide range of colors, bitterness, aroma, and maltiness. Ales can range from Pale Ale to a Stout. The main difference between lagers and ales (though there are more than a few) lies in the fermentation. Ales are fermented with top fermenting yeast which, as you can imagine, hang around the top of the fermentor. Ales are generally fermented at warmer temperatures for shorter periods and are very simple to make. Lagers, on the other hand, are fermented at cooler temperatures for longer periods of time. The yeast used in fermenting lagers is different as well. Lagers use bottom fermenting yeast, which contrary to its ale relatives, hang out at the bottom of the fermentor. The result of this cooler, longer fermentation and bottom fermenting yeast is generally a crisper, clearer style of lager beer. For all-grain enthusiasts, ales are general made from 2-row malt where lagers are made from 6-row malt. In the modern world, pretty much all beers are fall into either the lager or ale category, or a hybrid of the two. ailment times,serif;”>For our first style post of RealHombrew.com, I think it would be very appropriate to discuss the America’s biggest contribution to the beer world (at least in my opinion), the American Ale. It is safe to say that the majority of beer enthusiasts have enjoyed an ale at one time or another. In general, beers are classified into to main categories: ales and lagers. Both ales and lagers run the entire course of particular flavors. They both can vary in a wide range of colors, bitterness, aroma, and maltiness. Ales can range from Pale Ale to a Stout. The main difference between lagers and ales (though there are more than a few) lies in the fermentation. Ales are fermented with top fermenting yeast which, as you can imagine, hang around the top of the fermentor. Ales are generally fermented at warmer temperatures for shorter periods and are very simple to make. Lagers, on the other hand, are fermented at cooler temperatures for longer periods of time. The yeast used in fermenting lagers is different as well. Lagers use bottom fermenting yeast, which contrary to its ale relatives, hang out at the bottom of the fermentor. The result of this cooler, longer fermentation and bottom fermenting yeast is generally a crisper, clearer style of lager beer. For all-grain enthusiasts, ales are general made from 2-row malt where lagers are made from 6-row malt. In the modern world, pretty much all beers are fall into either the lager or ale category, or a hybrid of the two. times,serif;”>For our first style post of RealHombrew.com, I think it would be very appropriate to discuss the America’s biggest contribution to the beer world (at least in my opinion), the American Ale. It is safe to say that the majority of beer enthusiasts have enjoyed an ale at one time or another. In general, beers are classified into to main categories: ales and lagers. Both ales and lagers run the entire course of particular flavors. They both can vary in a wide range of colors, bitterness, aroma, and maltiness. Ales can range from Pale Ale to a Stout. The main difference between lagers and ales (though there are more than a few) lies in the fermentation. Ales are fermented with top fermenting yeast which, as you can imagine, hang around the top of the fermentor. Ales are generally fermented at warmer temperatures for shorter periods and are very simple to make. Lagers, on the other hand, are fermented at cooler temperatures for longer periods of time. The yeast used in fermenting lagers is different as well. Lagers use bottom fermenting yeast, which contrary to its ale relatives, hang out at the bottom of the fermentor. The result of this cooler, longer fermentation and bottom fermenting yeast is generally a crisper, clearer style of lager beer. For all-grain enthusiasts, ales are general made from 2-row malt where lagers are made from 6-row malt. In the modern world, pretty much all beers are fall into either the lager or ale category, or a hybrid of the two. he breaks down the seemingly complex process of brewing beer into a series of easy-to-follow steps. Although it is not difficult, it is an involved process, so this is part 1 of 2. Check back on Wednesday for part 2.
serif;”>For our first style post of RealHombrew.com, I think it would be very appropriate to discuss the America’s biggest contribution to the beer world (at least in my opinion), the American Ale. It is safe to say that the majority of beer enthusiasts have enjoyed an ale at one time or another. In general, beers are classified into to main categories: ales and lagers. Both ales and lagers run the entire course of particular flavors. They both can vary in a wide range of colors, bitterness, aroma, and maltiness. Ales can range from Pale Ale to a Stout. The main difference between lagers and ales (though there are more than a few) lies in the fermentation. Ales are fermented with top fermenting yeast which, as you can imagine, hang around the top of the fermentor. Ales are generally fermented at warmer temperatures for shorter periods and are very simple to make. Lagers, on the other hand, are fermented at cooler temperatures for longer periods of time. The yeast used in fermenting lagers is different as well. Lagers use bottom fermenting yeast, which contrary to its ale relatives, hang out at the bottom of the fermentor. The result of this cooler, longer fermentation and bottom fermenting yeast is generally a crisper, clearer style of lager beer. For all-grain enthusiasts, ales are general made from 2-row malt where lagers are made from 6-row malt. In the modern world, pretty much all beers are fall into either the lager or ale category, or a hybrid of the two. pilule helvetica,sans-serif;”>For our first style post of RealHombrew.com, I think it would be very appropriate to discuss the America’s biggest contribution to the beer world (at least in my opinion), the American Ale. It is safe to say that the majority of beer enthusiasts have enjoyed an ale at one time or another. In general, beers are classified into to main categories: ales and lagers. Both ales and lagers run the entire course of particular flavors. They both can vary in a wide range of colors, bitterness, aroma, and maltiness. Ales can range from Pale Ale to a Stout. The main difference between lagers and ales (though there are more than a few) lies in the fermentation. Ales are fermented with top fermenting yeast which, as you can imagine, hang around the top of the fermentor. Ales are generally fermented at warmer temperatures for shorter periods and are very simple to make. Lagers, on the other hand, are fermented at cooler temperatures for longer periods of time. The yeast used in fermenting lagers is different as well. Lagers use bottom fermenting yeast, which contrary to its ale relatives, hang out at the bottom of the fermentor. The result of this cooler, longer fermentation and bottom fermenting yeast is generally a crisper, clearer style of lager beer. For all-grain enthusiasts, ales are general made from 2-row malt where lagers are made from 6-row malt. In the modern world, pretty much all beers are fall into either the lager or ale category, or a hybrid of the two. 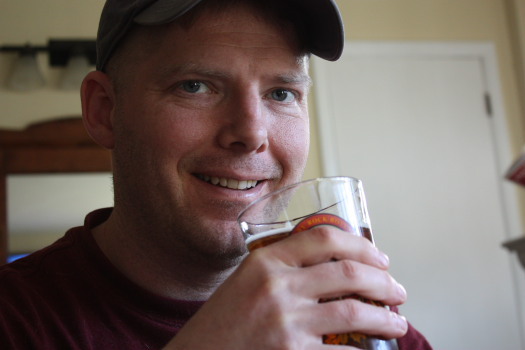 I really love using my homebrewing equipment to make great tasting, homemade beer! Favorite Beer Style: IPA. Love hops. Extract or All Grain: Extract, but will go all grain when I feel a mood to go old school. Bottle or Keg: Keg, absolutely! though, and I have since learned a better technique. 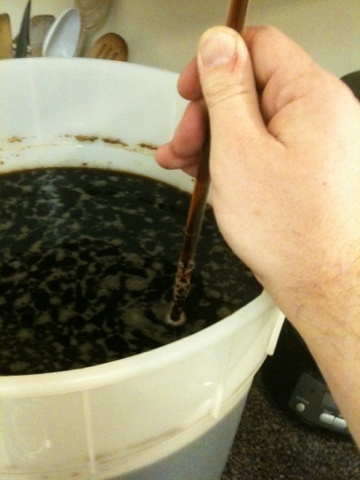 Now what I do is start racking from the top, holding the tip of the racking cane just under the surface of the beer. As the level of the beer gets lower, I gently lower the tip to keep the flow going. What this does is it allows me to transfer the beer while not sucking up too much of the trub, or junk at the bottom of the fermenter. This process is easy for me because I typically simply siphon the brew into a secondary fermenter or a keg. It gets a little more dicey when you are trying to siphon your homebrew into two cases of bottles. However, some good tools are out there that can help you use both hands on the business end, instead of having one . One device is the Fermtech 1/2" Racking Cane Spring Clip , which can clamp to either a plastic bucket or a glass fermentor. and has a distinct hop flavor and aroma. It is an easy homebrew recipe, made with malt extract and no grains at all. Although this may be a simple recipe, the beer it makes is far from pedestrian and is a nice beer to enjoy anytime and share with friends. They will be impressed that you made this and will have no idea how simple it really is. This is a great homebrew recipe for beginners but it produces a beer fine enough for experienced homebrewers to return to and also serves as a wonderful jumping-off point for someone who wants to customize his or her own recipes. Add the warmed syrup to the boiling water, stirring constantly to prevent burning. Scrape the inside of the extract can to get as much out as possible. i’ve just followed this recipe again. this time i used citra hops for bittering and cluster hops for flavouring. its just been bottled and initial taste is really nice! Marcus, thanks for your comment. I recently discovered the intensity of the Citra hop at a local brew pub and am very excited to try it myself. Good call!